If you live in the United States and you have a library card, you should check to see if your local library offers Hoopla, a digital service that provides ebooks, audiobooks recorded music, movies, TV shows and comic books to your computer, smart phone or tablet. Hoopla is easily the best of the library digital services. If your local library does not have Hoopla, try to get a library card for a library that does. I just ran a search for "Robert Anton Wilson" on Hoopla and found two items of interest. "Robert Anton Wilson: The Universe Contains a Maybe," is a 57-minute video. 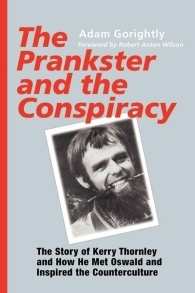 My search also turned up an ebook, Adam Gorightly's The Prankster and the Conspiracy, his biography of Kerry Thornley, which every RAW fan should read.